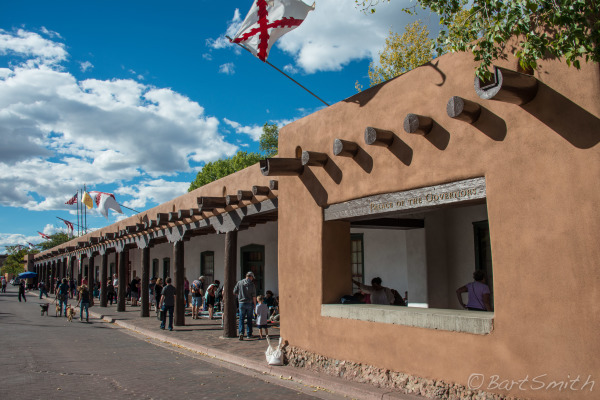 Palace of the Governors, Santa Fe Plaza, Santa Fe, New Mexico. 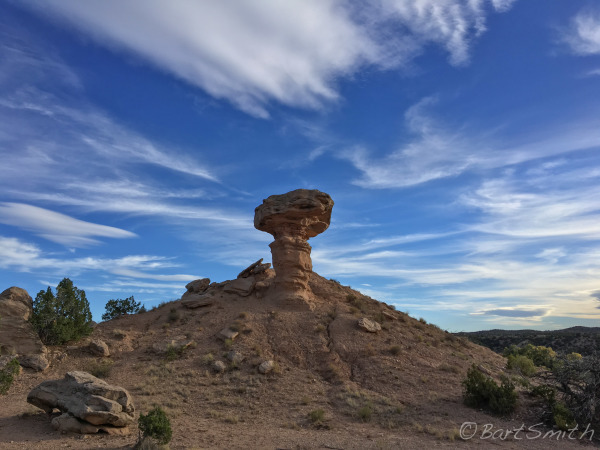 Camel Rock, a famous balanced rock and namesake of Camel Rock Casino just north of Tesuque Pueblo, New Mexico. Seeking, searching for Knowing. 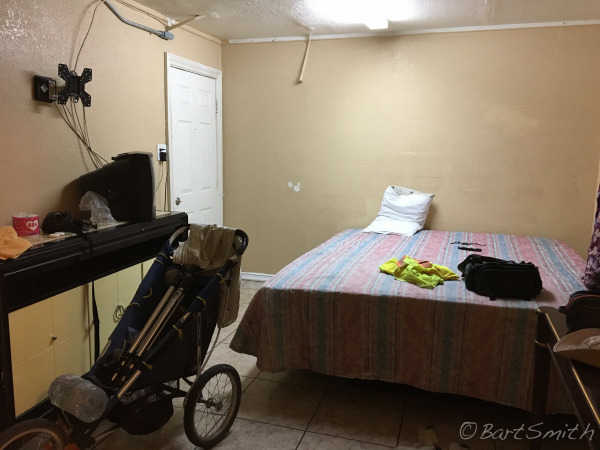 Espanola, New Mexico. 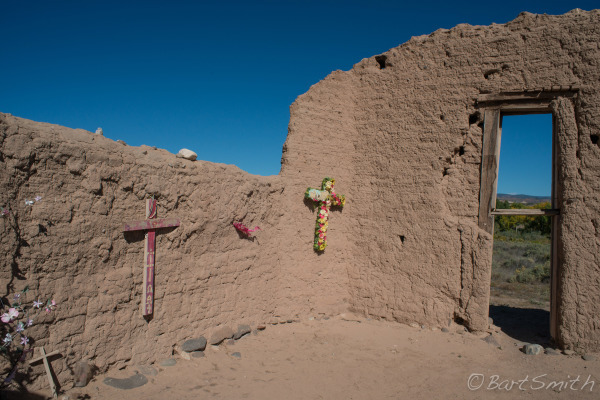 Remnants of church Santa Rosa de Lima near Abiquiu, New Mexico. 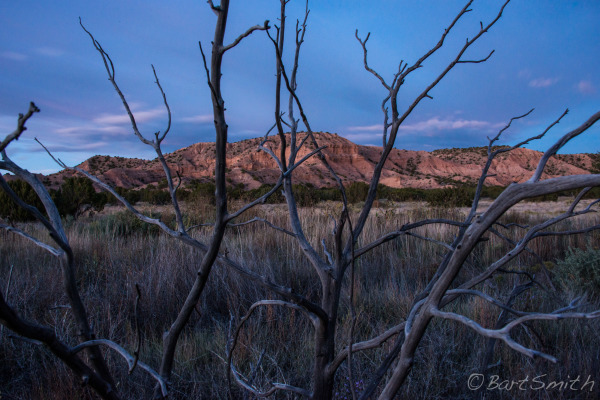 Ghost ranch escarpment from HW 84, New Mexico. 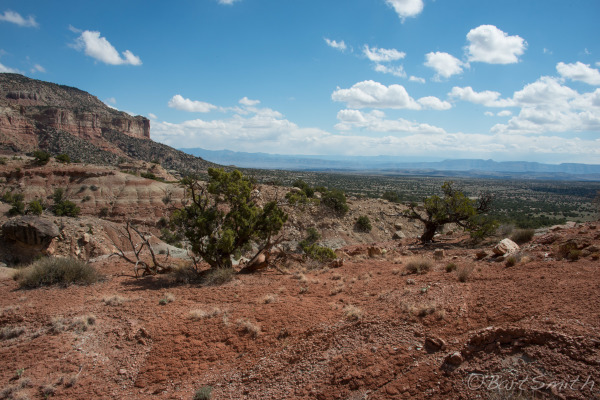 Ghost ranch escarpment, New Mexico. 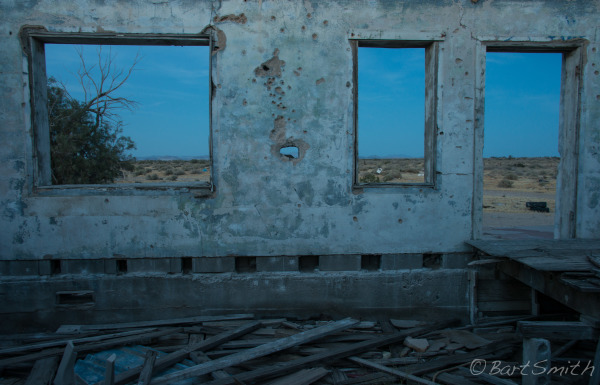 Somewhere along HW 84, New Mexico. 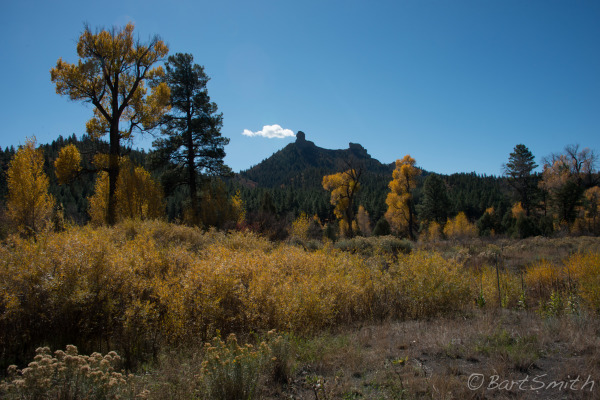 Chimney Rock from HW 160 near Piedra, New Mexico. 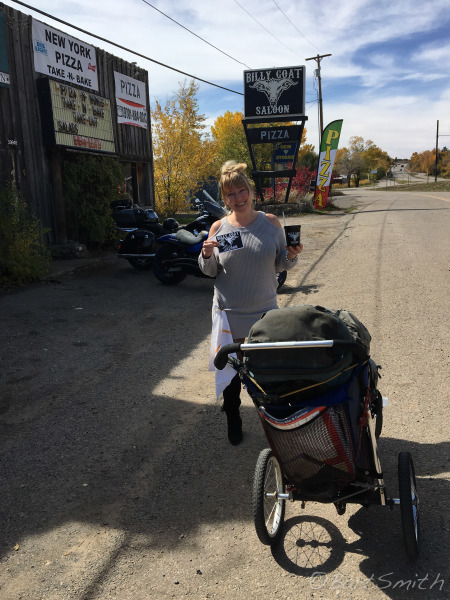 This kind waitress stepped out of the Billy goat Saloon to offer me iced water and a decal. 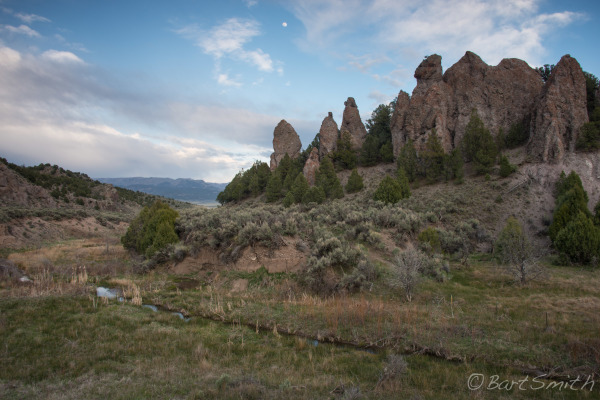 West of Bayfield, Co. 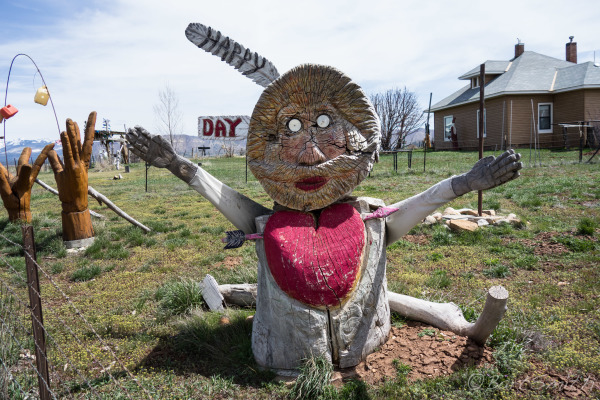 Artwork displayed beside HW 160 west of Mancos, Co.
Wilson Arch from HW 191. Utah. 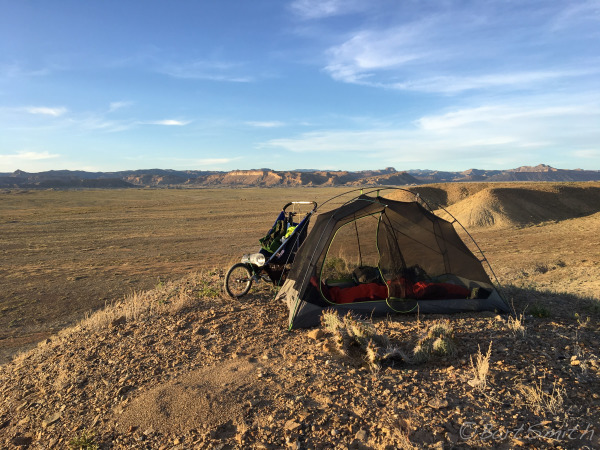 Camp along HW 191 north of Wilson Arch, Utah. 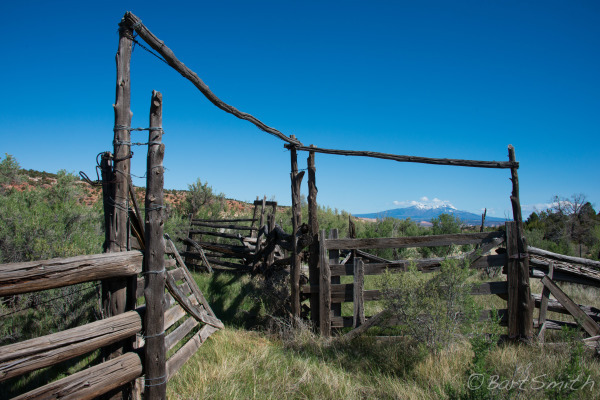 Old Spanish Trail Arena a few miles south of Moab, Utah. 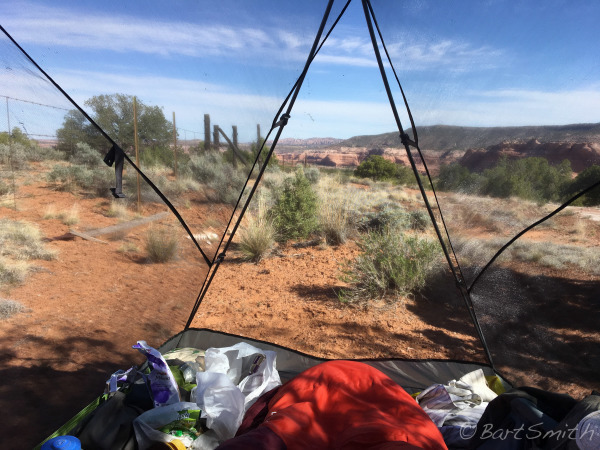 Camp from near road 334 crossing Crescent Bench, Utah. 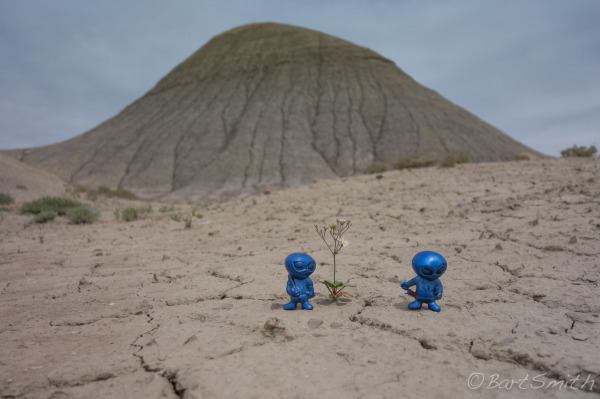 Zanu and Banu investigating badlands near Solitude Wash a few miles southwest of Green River, Utah. 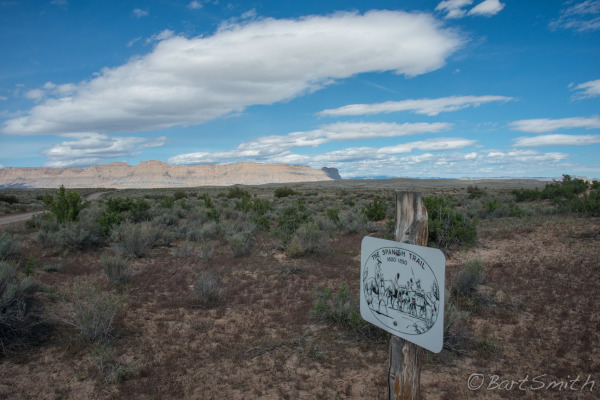 Sign designating the route of the Old Spanish Trail along Rd 1030 in Saleratus Wash, Utah. 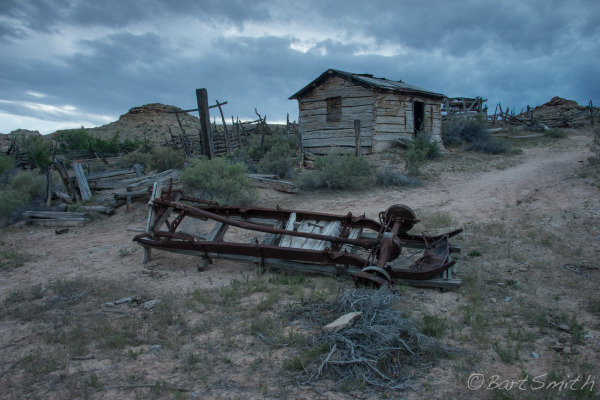 Remnants of Smith Cabin Homestead. Not directly related to the Old Spanish Trail but utilized the same spring as the early travelers. 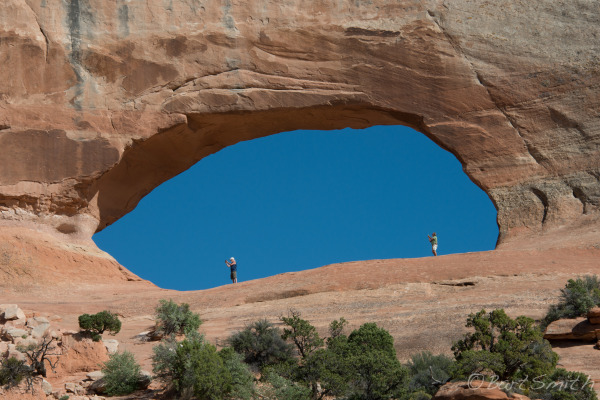 Tidwell Draw, Utah. Cottonwood tree that may have been a sapling when the Spanish traders travelled by. 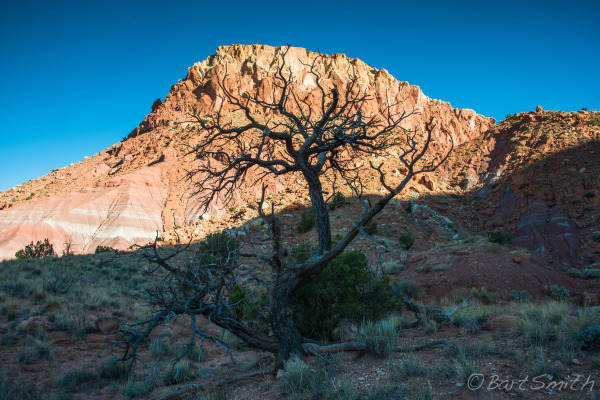 Cottonwood Wash, Utah. 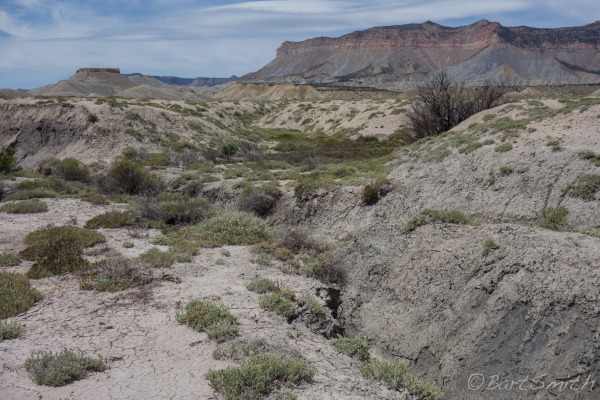 View east of corridor where the Old Spanish Trails traversed from the base of the Cedar Mountains , San Rafael Swell, Utah. 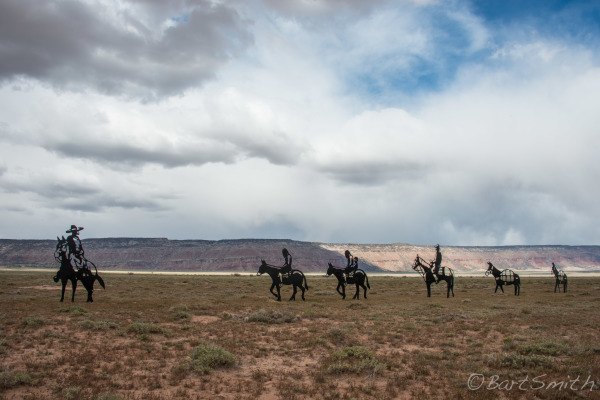 Iron sculptures depicting travelers along the Old Spanish Trails crossing Buckhorn Flat south of the Cedar Mountains , San Rafael Swell, Utah. Rock Canyon along Castle Valley a few miles south of Castle Dale, Utah. 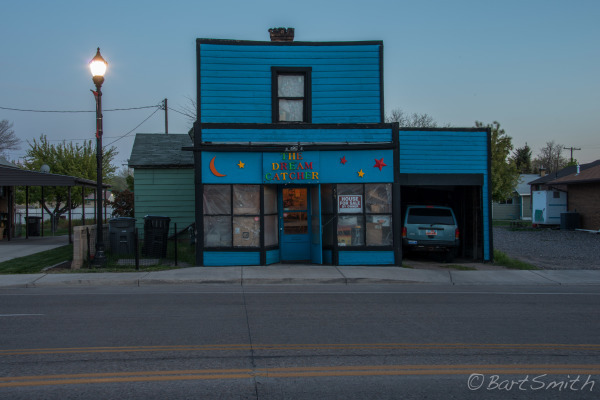 Whimsical building in Salina, Utah. 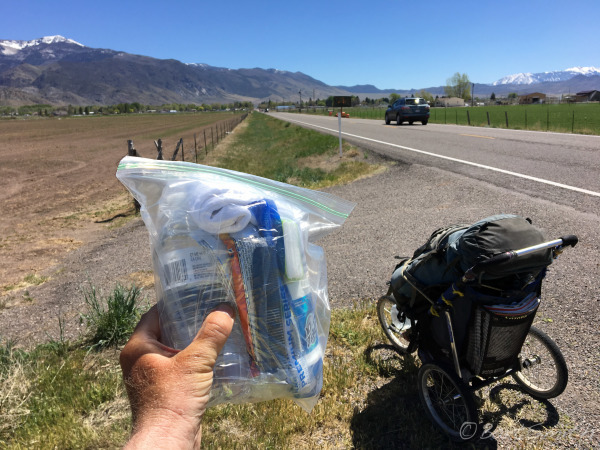 A kind gift bag from a passerby near Monroe, Utah. 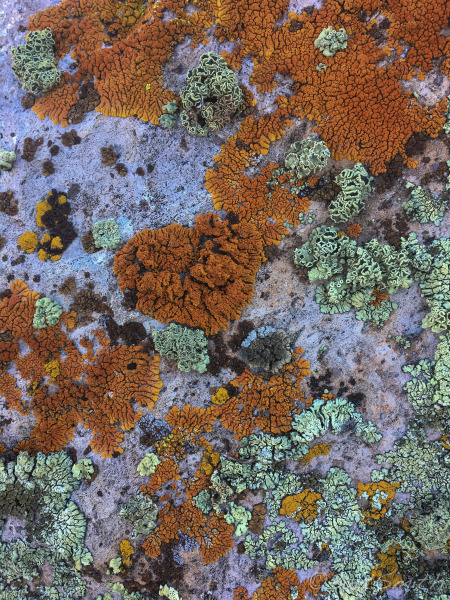 Lichen on boulder near Poverty Flat along Sevier River Valley, Utah. 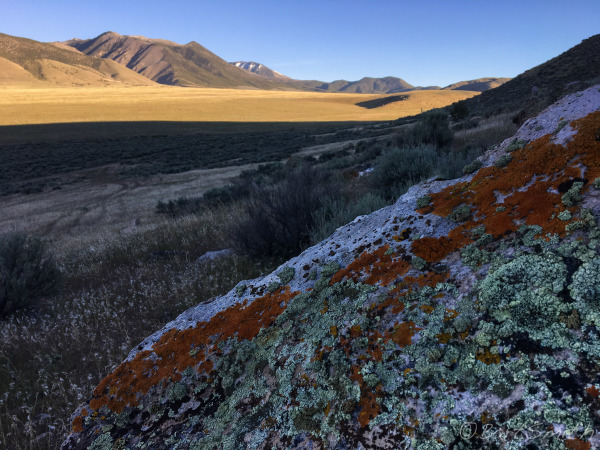 Lichen on boulder near Poverty Flat along Sevier River Valley, Utah. 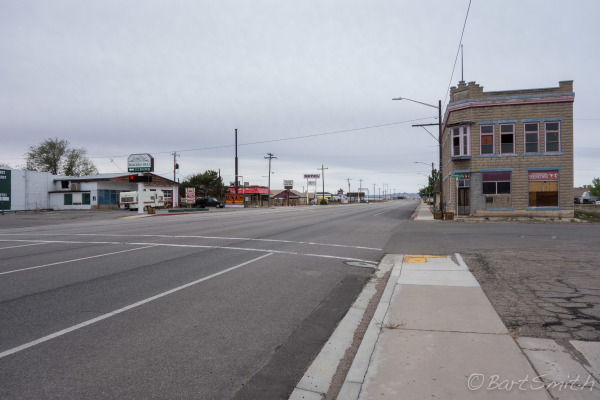 A few days later I walked into Circleville Utah and stayed at the Circleville RV Park. A huge Thank You to the proprietors Glen and Tanja for all the kind hospitality. 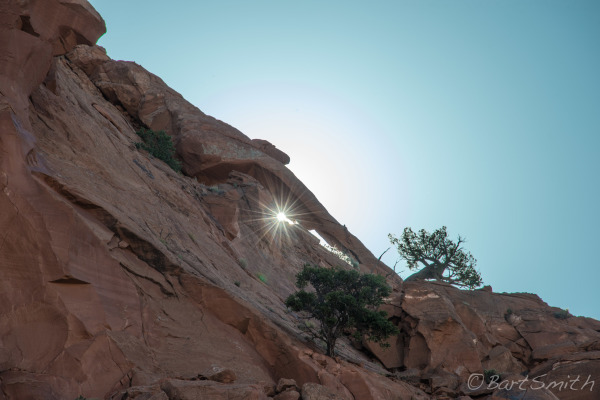 The Old Spanish Trail skirted this rock formation along Bear Creek west of Bear Junction, Utah. Earlier in the day I walked with another fellow, Lubo Falcon, who was walking from Florida to San Fran. 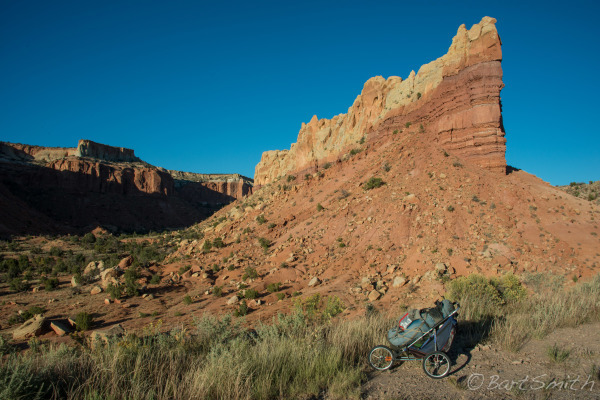 It is always heartening to share the trail with another wandering soul. 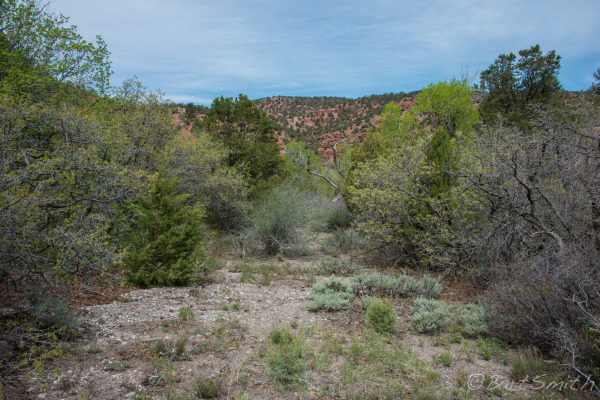 Original trace of the Old Spanish Trail descending through Little Creek Canyon, (near Forest Road 077), Dixie National Forest, Utah. 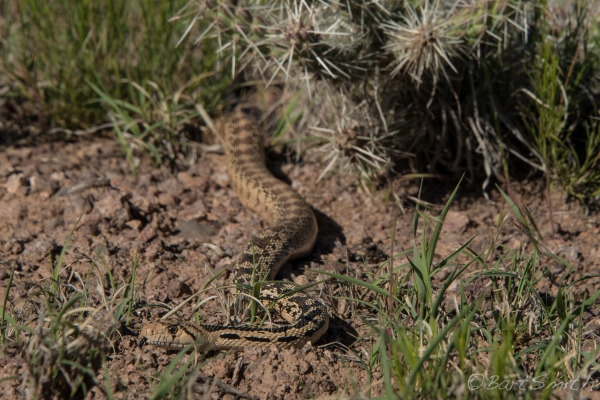 Glossy Snake, Escalante Valley, north of new Castle, Utah. 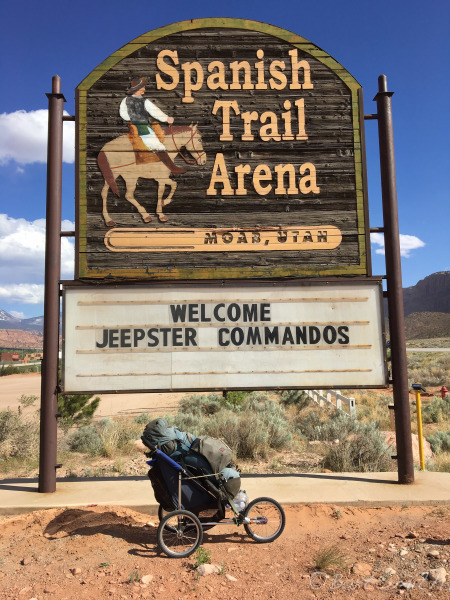 Sign designating the Old Spanish Trail near New Castle, Utah. 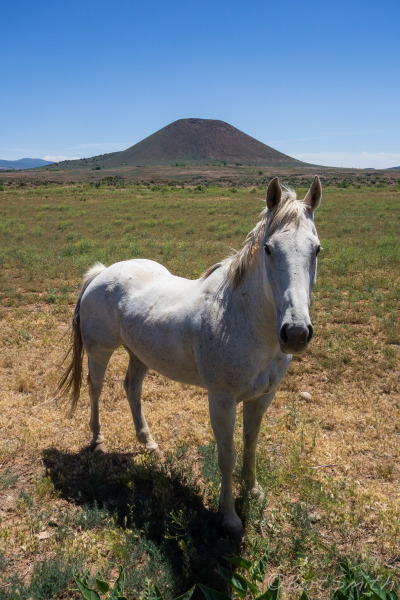 Horse in front of Veyo Volcano, a geologic landmark along the Old Spanish Trail, Veyo Utah. 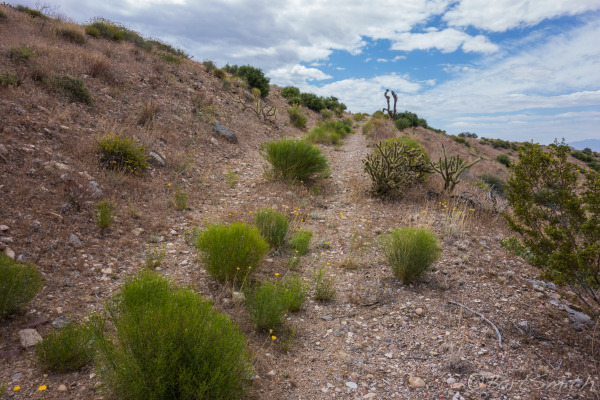 Trace of the Old Spanish Trail westbound near Castle Cliffs. Joshua Tree Natural National Landmark, Utah. Trace of the Old Spanish Trail eastbound approaching Castle Cliffs. 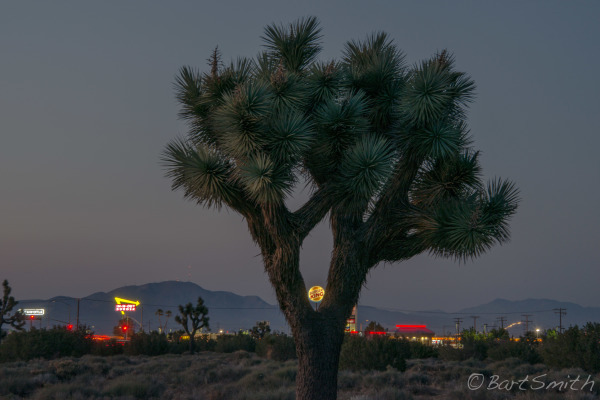 Joshua Tree Natural National Landmark, Utah. 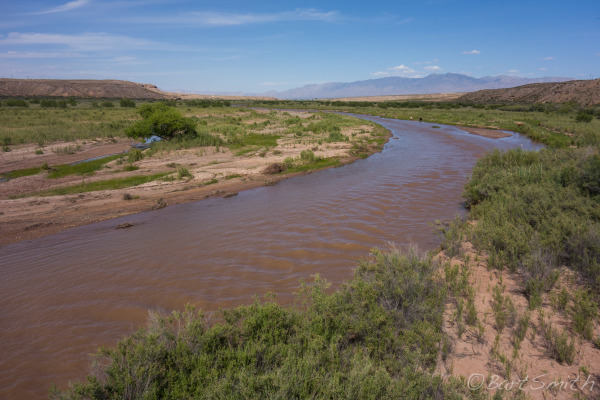 The Virgin River, very important water source along the Old Spanish trail, a few miles south of Mesquite, Nevada. 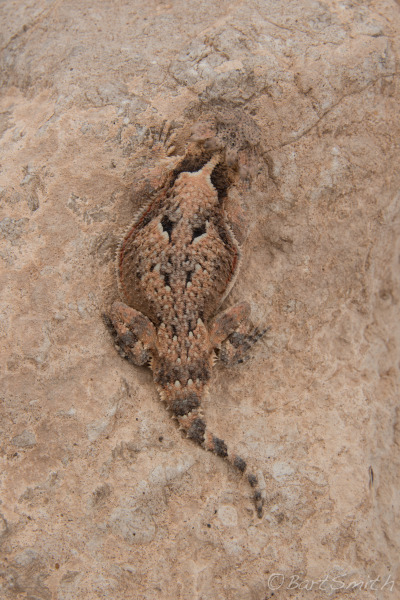 Horned Lizard beside the Old Spanish Trial in Halfway Wash, Nevada. 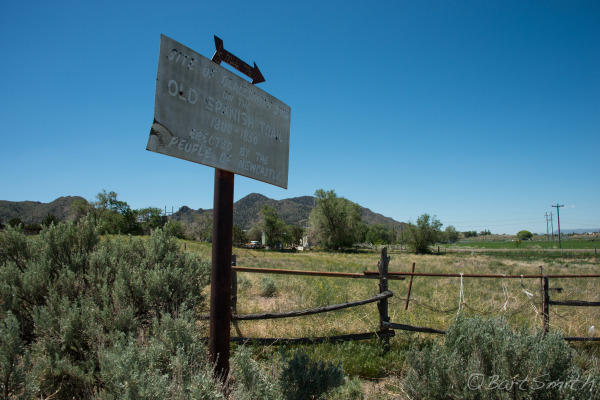 Trace of the Old Spanish Trail ascending Virginia Hill and Mormon Mesa. 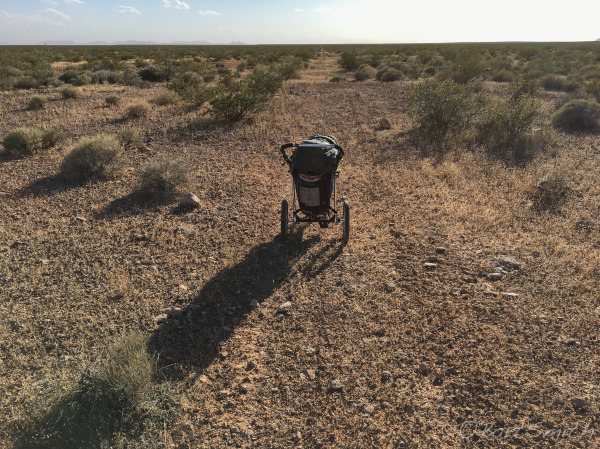 (The longest continuous trace along the entire route). Nevada. 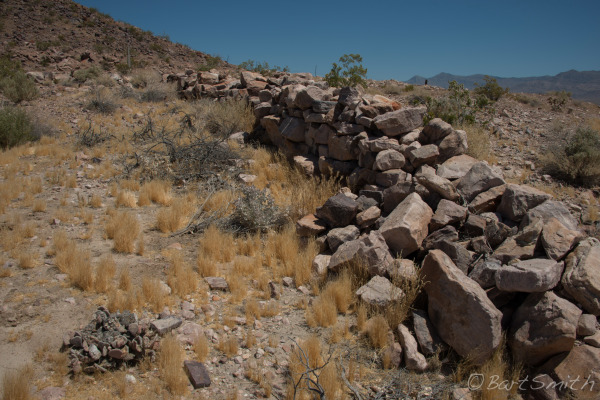 Along Trace of the Old Spanish Trail ascending Virginia Hill and Mormon Mesa. 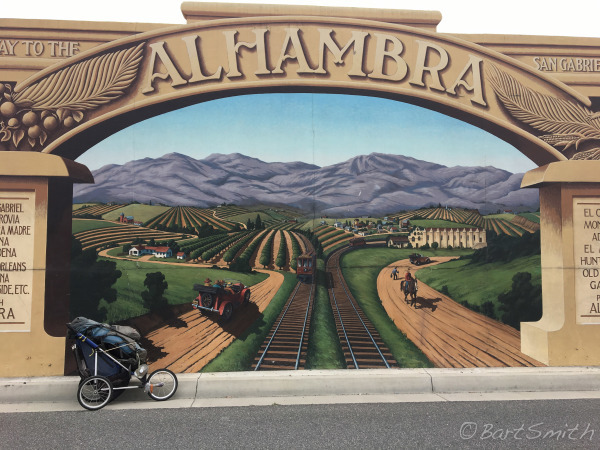 (The longest continuous trace along the entire route). Nevada. 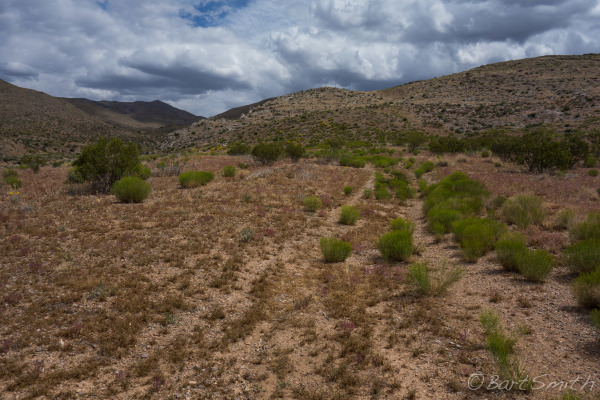 Trace of the Old Spanish Trail ascending Virginia Hill and Mormon Mesa. Nevada. 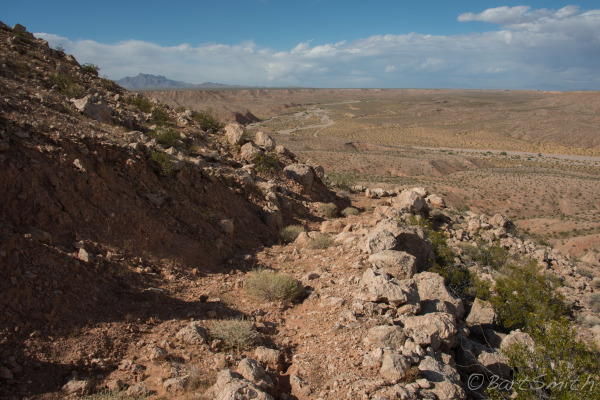 Trace of the Old Spanish Trail descending Virginia Hill and Mormon Mesa heading towards Halfway Wash. Nevada. 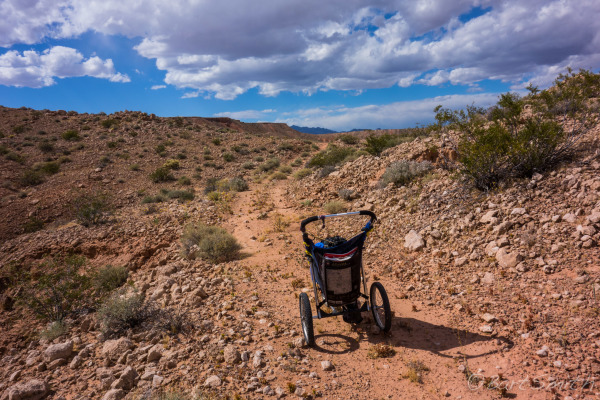 Along the Old Spanish Trail across the Mormon Mesa, Nevada. 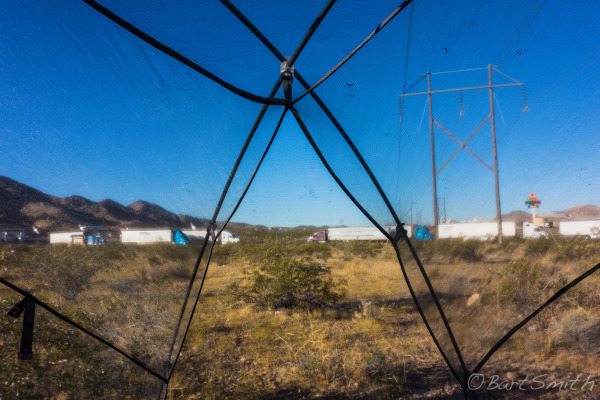 Camp along the Old Spanish trail at the intersection of HW 93 and I 15, 20 miles northwest of Las Vegas. Nevada. 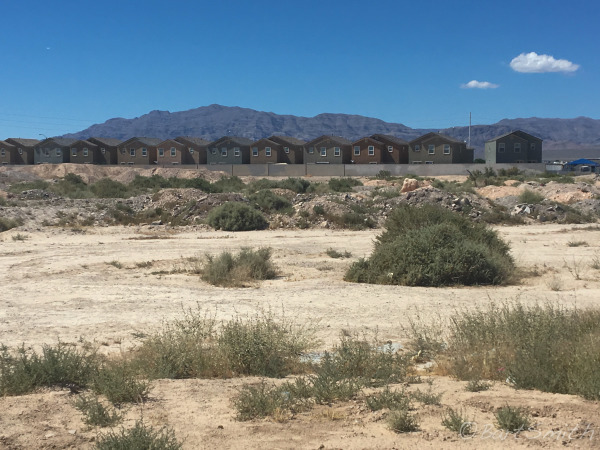 Houses in desert, northwest Las Vega, Nevada. H2O, Las Vegas Wash, Las Vegas, Nevada. 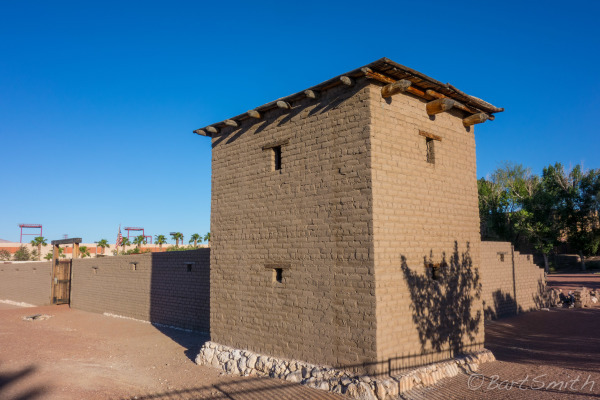 Old Las Vegas Mormon Historic Fort, Nevada. 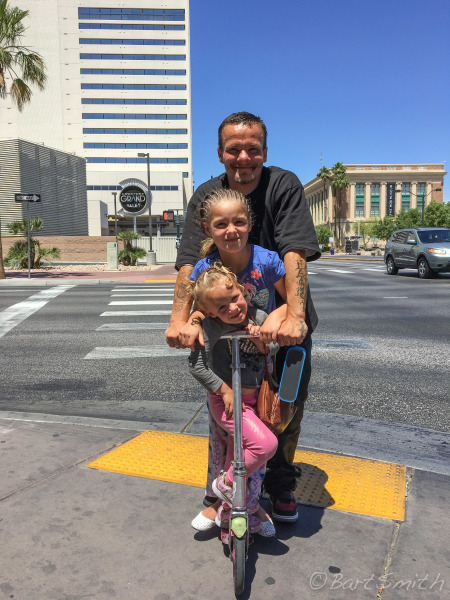 Dad and daughters riding the streets of Vegas, Nevada. 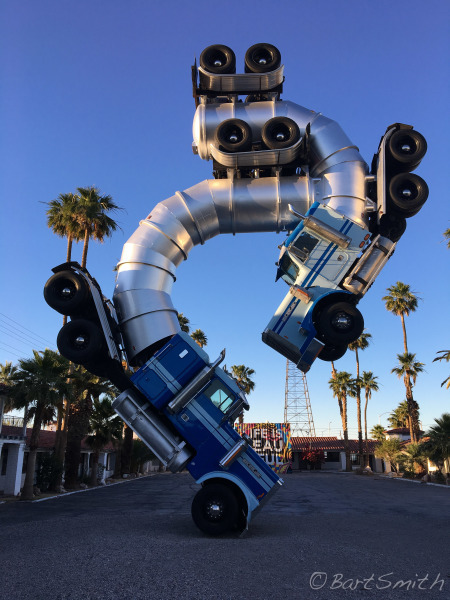 What happens in Vegas stays in Vegas.... unless you post it. 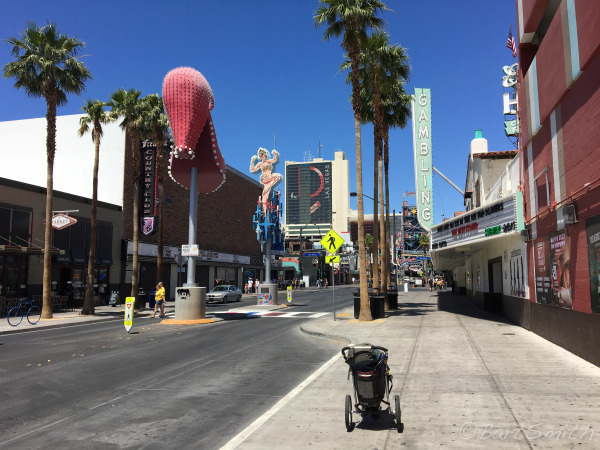 Old Moulin Rouge Casino location, Las Vegas, Nevada. 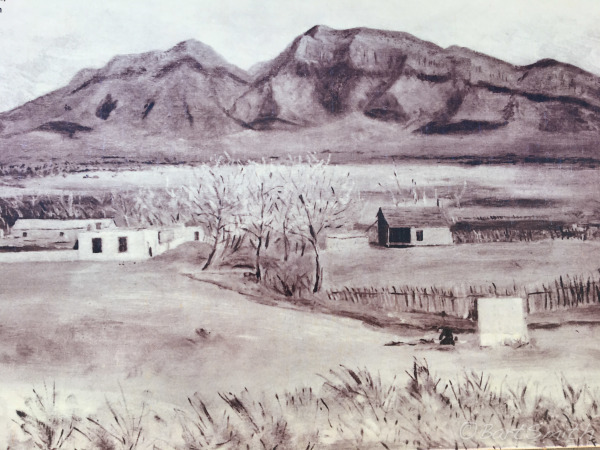 Oil on canvas, painted by Frederick S. Dellebaugh from a sketch made at Los Vegas Rancho in 1876. 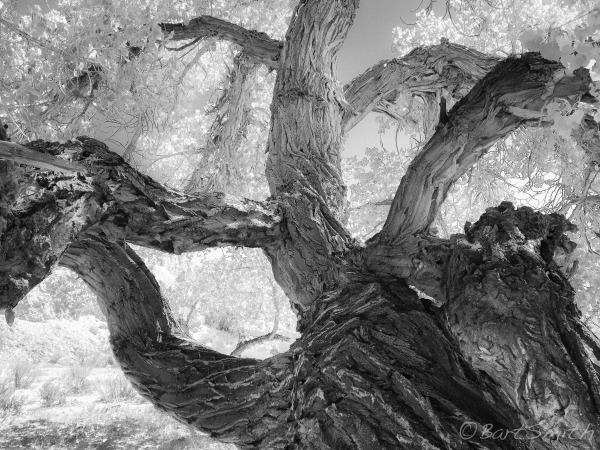 This image is a photograph from a kiosk at Las Vegas Springs Preserve, Las Vegas. 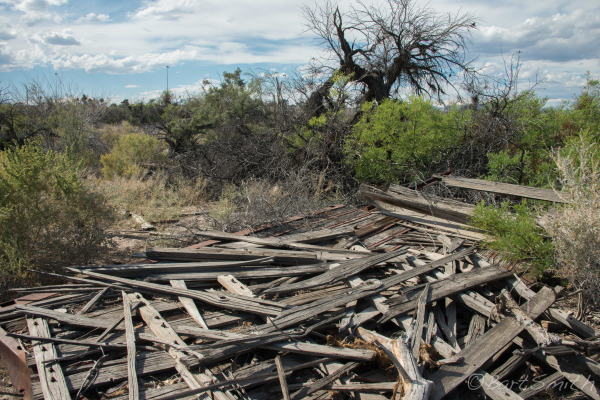 Remains of a ranch building at the springs which were an important water source along the Old Spanish Trail and namesake of the future city of Las Vegas, Las Vegas Springs Preserve, Las Vegas. Nevada. 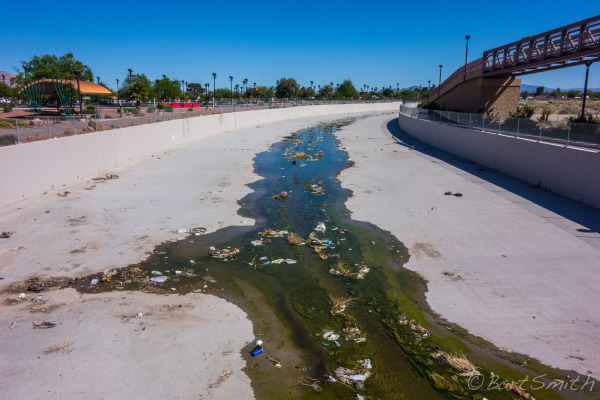 Lush growth still flourishes at Las Vegas Springs although the water level is much lower than when the Old Spanish Trail existed, Springs Preserve, Las Vegas. 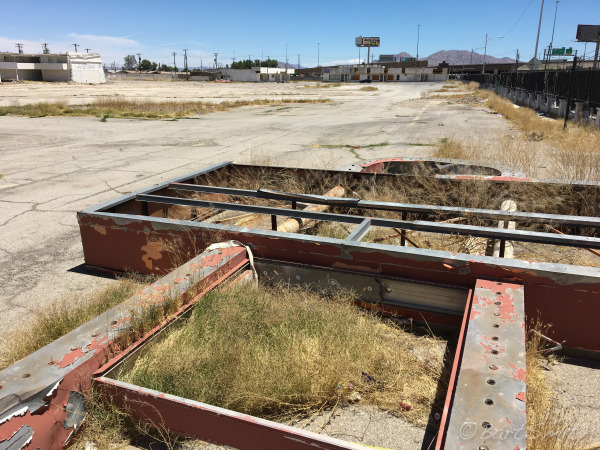 The skyline of Las Vegas can be seen in the distance. 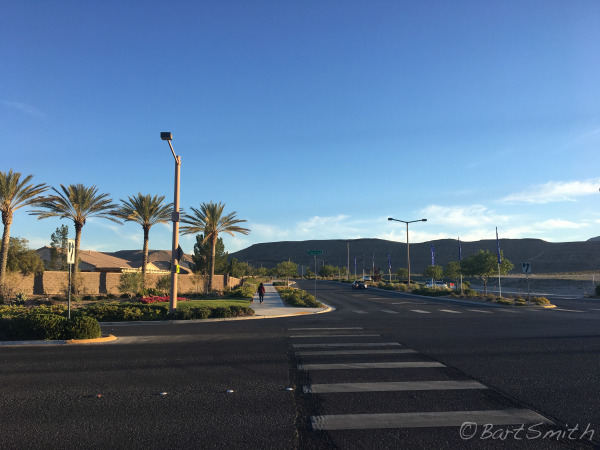 Las Vegas was an oasis along the Old Spanish Trail. Nevada. 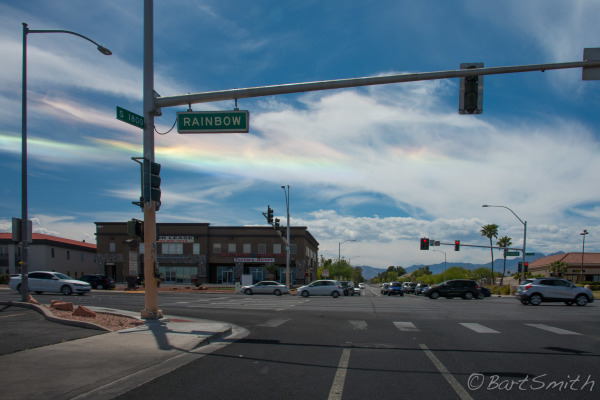 On the corner of Rainbow and Prism, Las Vegas. 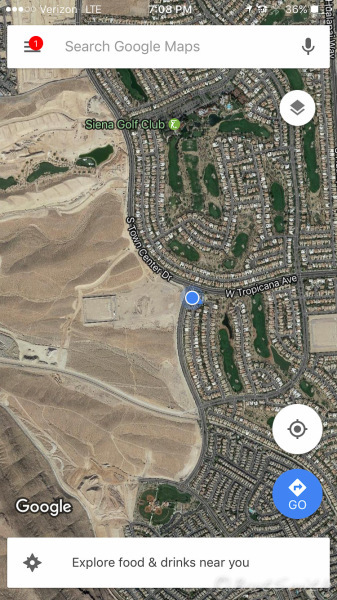 Burgeoning community on western edge of Las Vegas. Nevada. 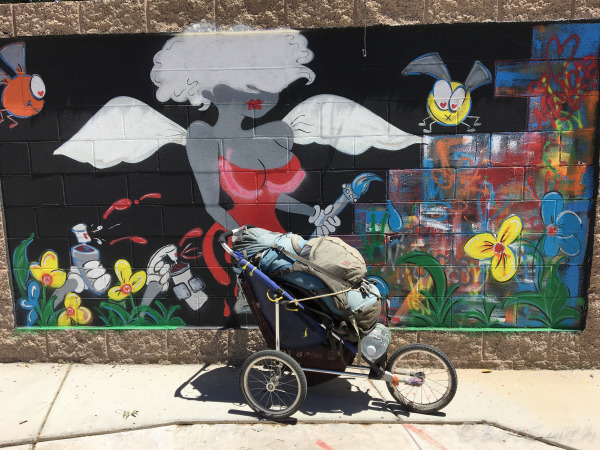 On the edge of wishful thinking, Las Vegas. Nevada. 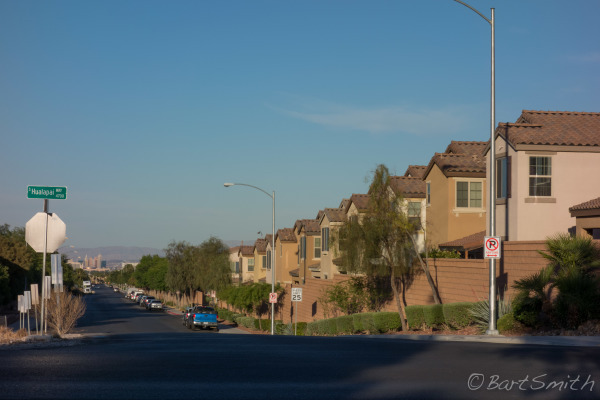 Residential community on western edge of Las Vegas. Nevada. 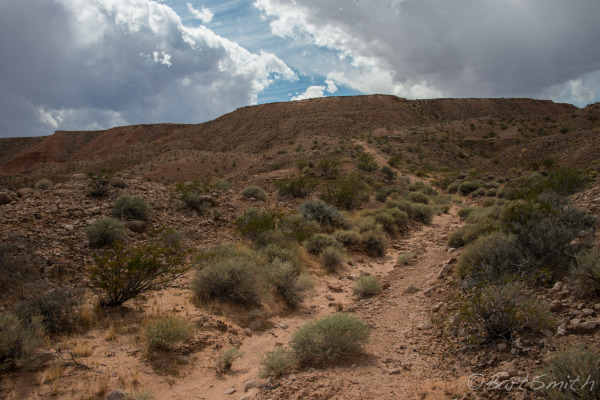 Old Spanish Trail followed this wash southwest of Las Vegas leading towards the Blue Diamond Hills, Nevada. 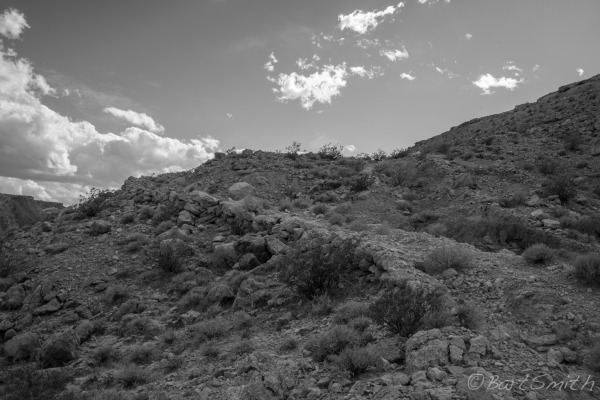 Along the Old Spanish Trail west of Las Vegas and heading towards the Blue Diamond Hills, Nevada. 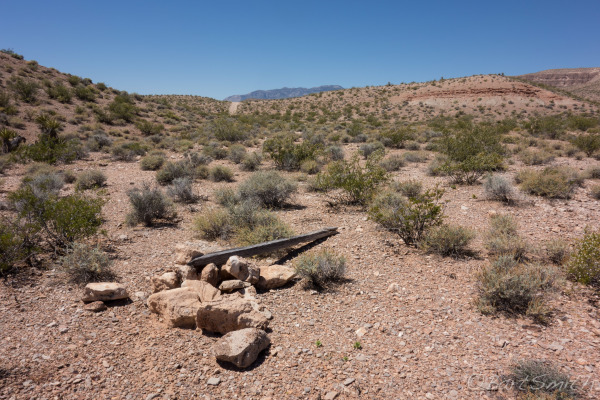 Original trace of the Old Spanish Trail a few miles west of Las Vegas and heading towards the Blue Diamond Hills, Nevada. 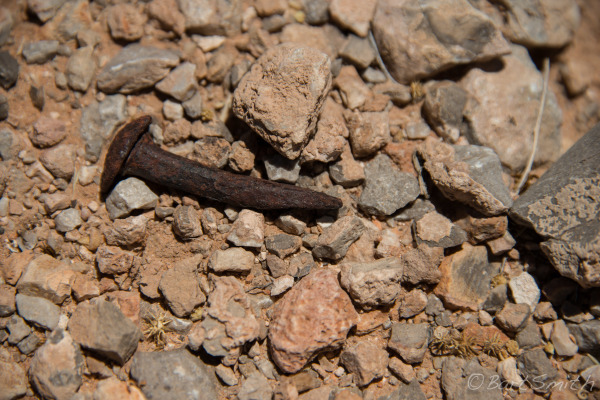 Rusted wagon nail on original trace of the Old Spanish Trail a few miles west of Las Vegas and heading towards the Blue Diamond Hills, Nevada. 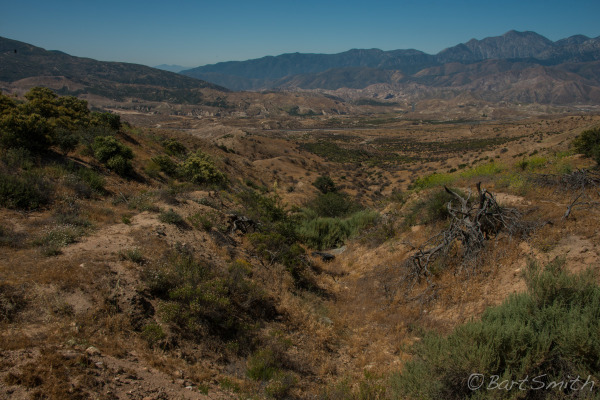 The Old Spanish Trail heading towards Blue Diamond Mountain and the village of Blue Diamond. Nevada. 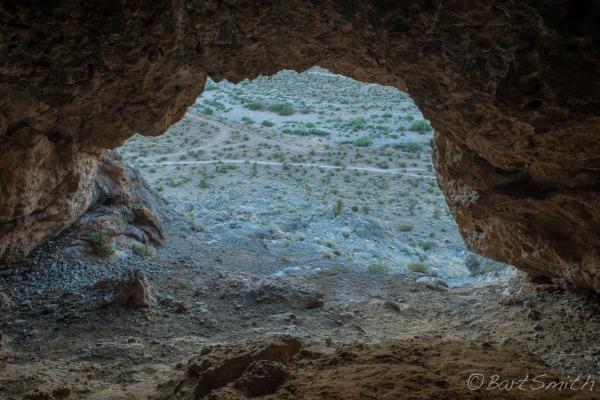 Old Spanish Trail viewed from a cave near Blue Diamond, Nevada. 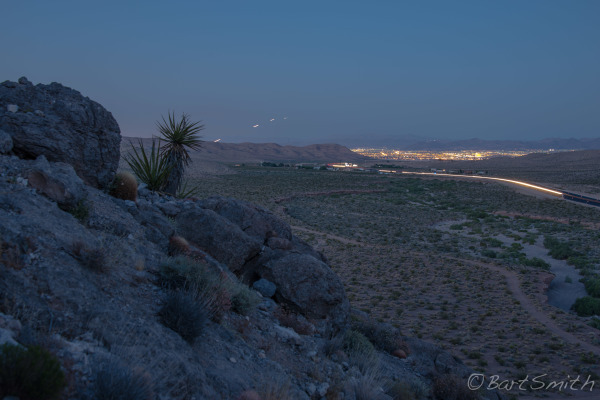 Lights of Las Vegas from Blue Diamond Hills above the Old Spanish Trail, Cottonwood Valley, Nevada. 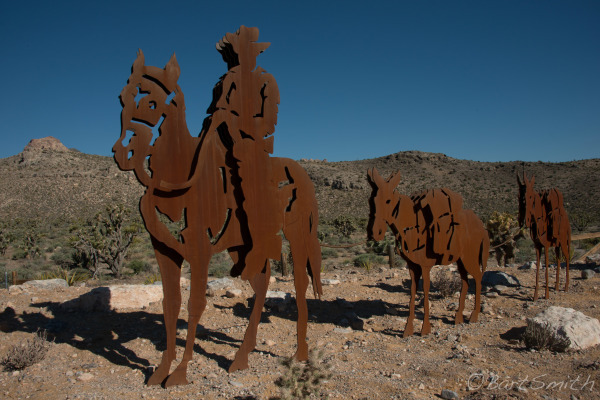 Sculpture memorializing the Old Spanish trail along HW 160 west of Las Vegas, the highway directly follows the historic route through Cottonwood Valley. Nevada. 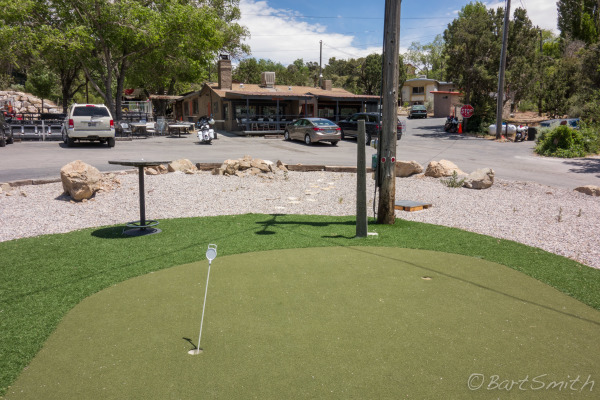 Post designating the Old Spanish trail on putting green in front of Mountain Springs Saloon. 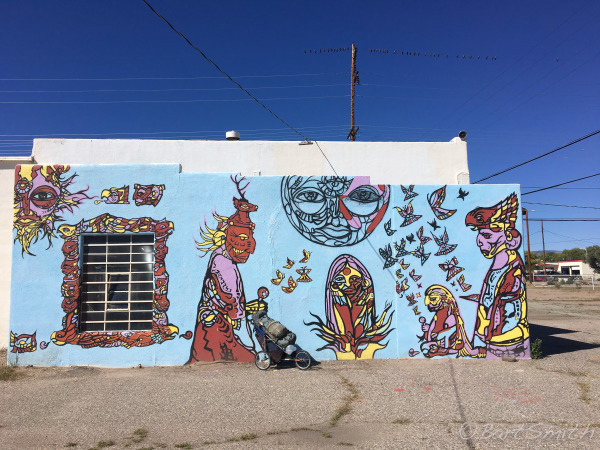 Mountain Springs, Nevada. 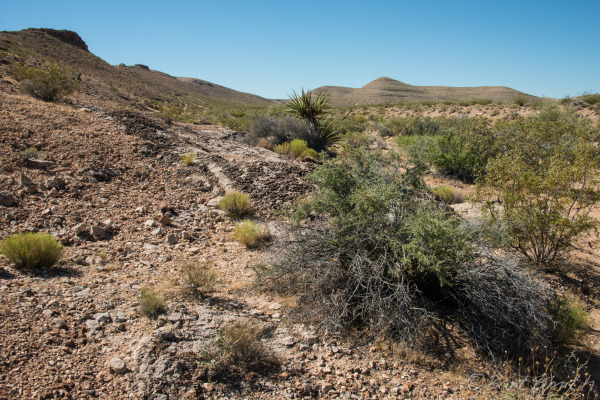 The springs were an important water source along the Old Spanish Trail. 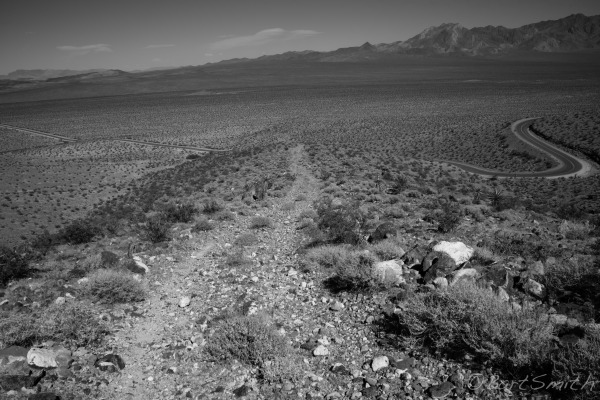 Original trace of the Old Spanish Trail descending eastbound from Emigrant Pass in the Nopah Range, California. 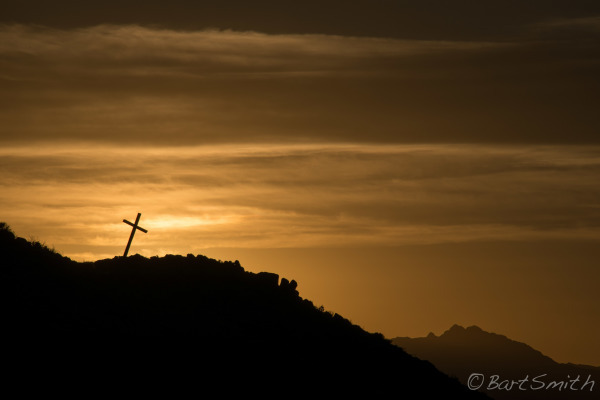 Cross on hill, Tecopa, California. 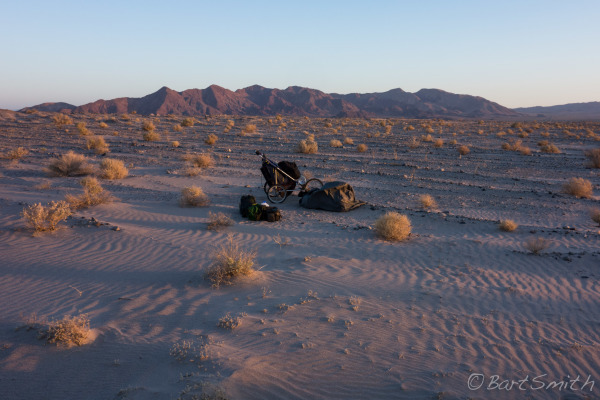 Daybreak from camp along Death Valley rd, Silurian Valley, California. 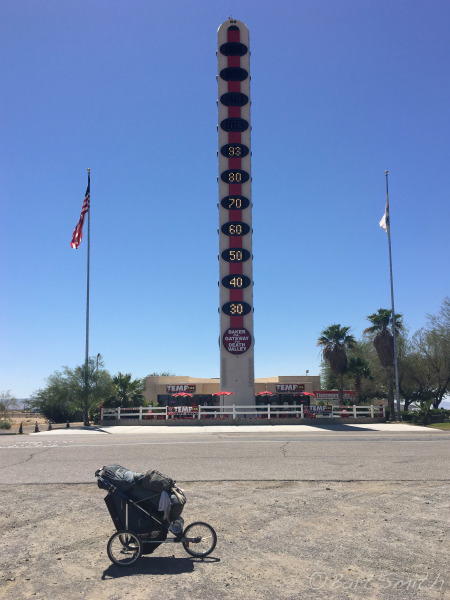 11:47:57 AM at the Worlds largest thermometer, Baker, California with a long way to go. 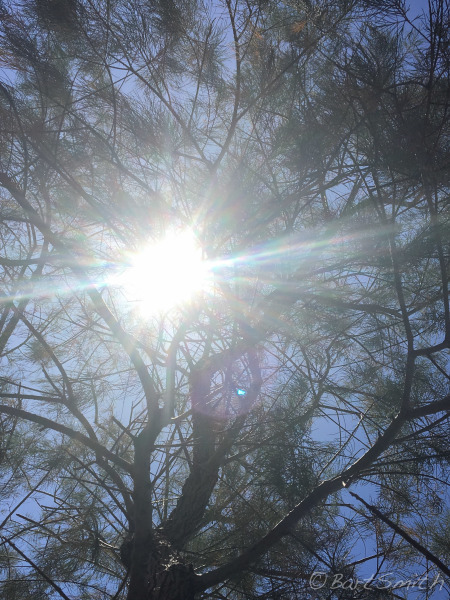 3:44:36 PM Seeking shade under a Tamarisk Tree in the Mojave Desert southwest of Baker, California. 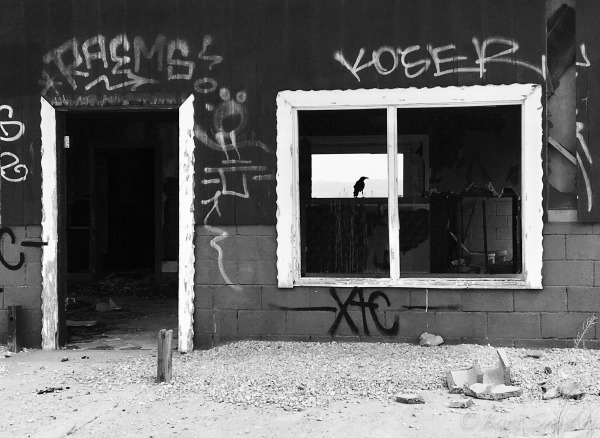 Abandoned store along Yerma Rd near Harvard, Mojave Desert, California. 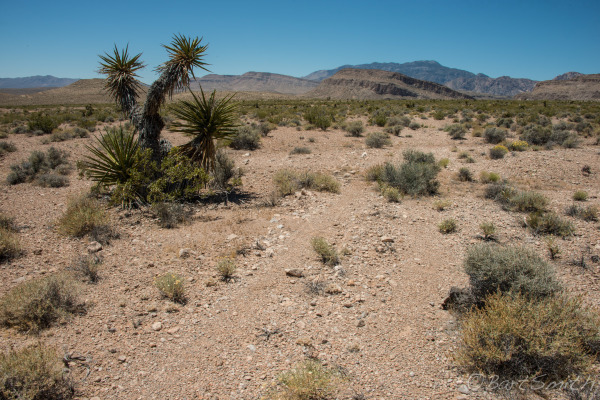 Location along the Old Spanish Trail known as Forks of the Road, west of Yermo, California. 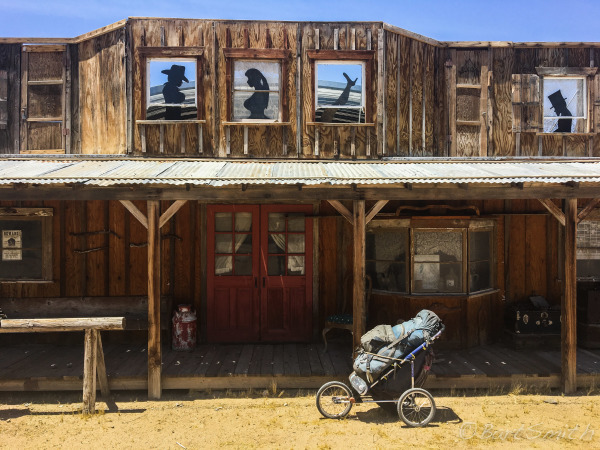 A freight and stage station known as Hawley Station existed on the Old Spanish Trail at about the same location as this now abandoned ranch house, an important location on the Old Spanish Trail in the Mojave Desert known as Forks of the Road, West of Yermo, California. 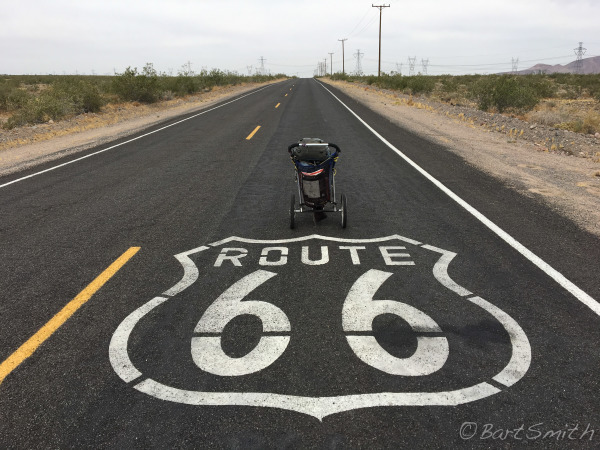 Route 66 parallels and directly follows sections of the Old Spanish Trail from the Mojave Valley all the way through Cajon Pass, California. 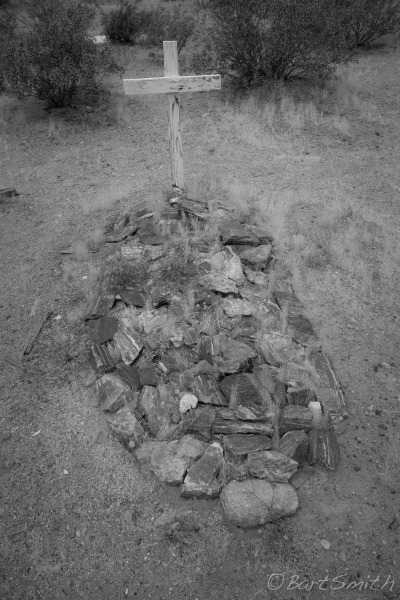 Daggett Pioneer Cemetery, Daggett, California. 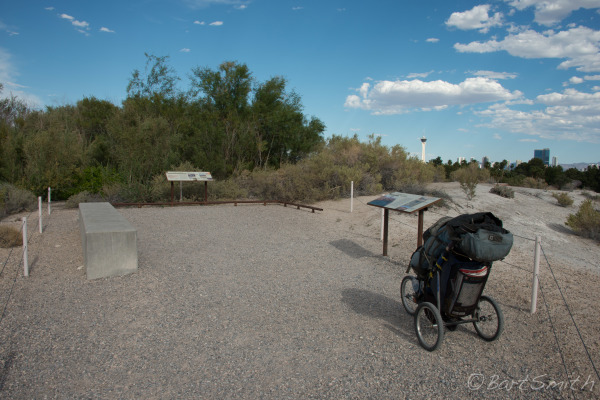 Some buried here were descents of Old Spanish Trail travelers. 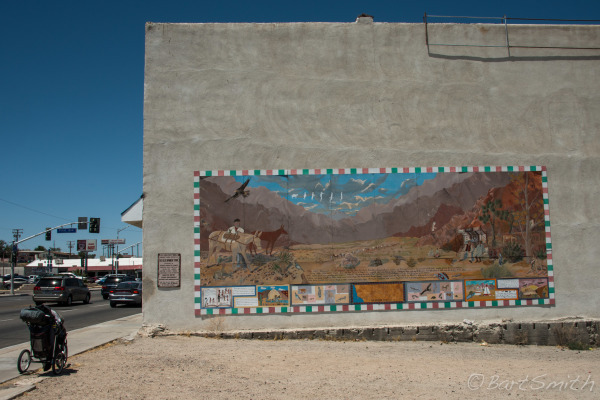 Old Spanish Trail in Barstow, California. 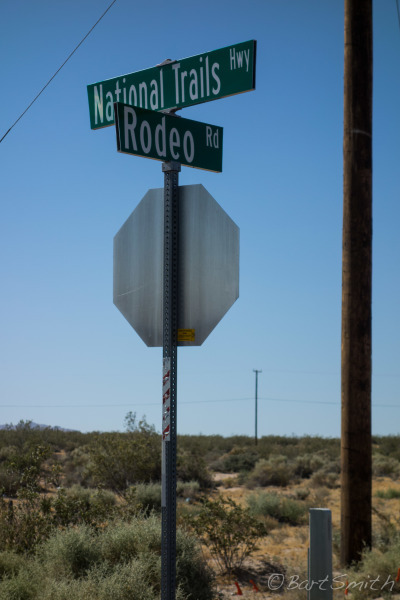 Along Route 66, Mojave Valley, California. 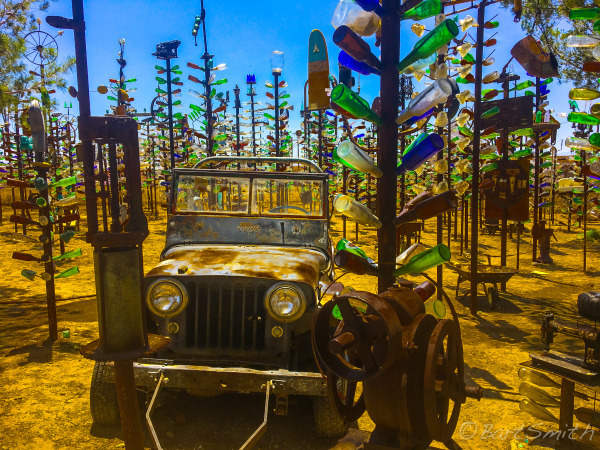 Elmer's Bottle Tree Ranch, a famous stop along Route 66 between Barstow and Victorville, California. 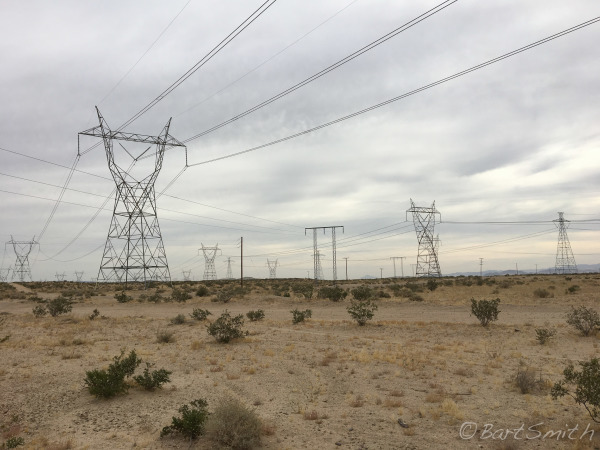 Ever expanding development into Mojave Desert southwest of Victorville, California. 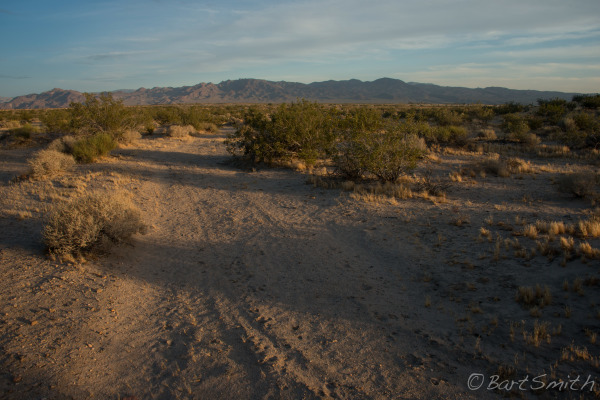 Original trace of the Old Spanish Trail (to the left) entering Cajon Canyon, California. Like crossing paths with an old friend. 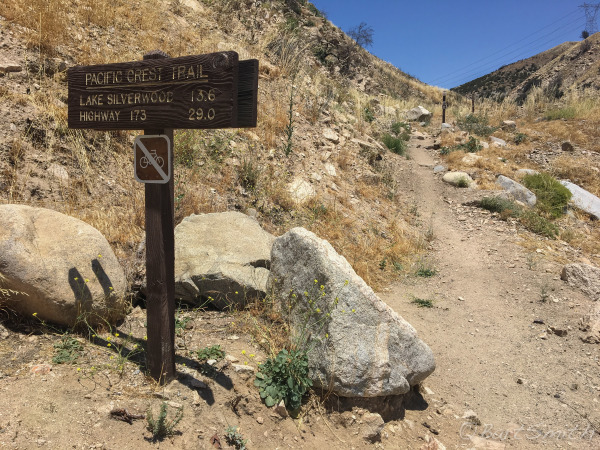 Pacific Crest Trail, Cajon Canyon, California. 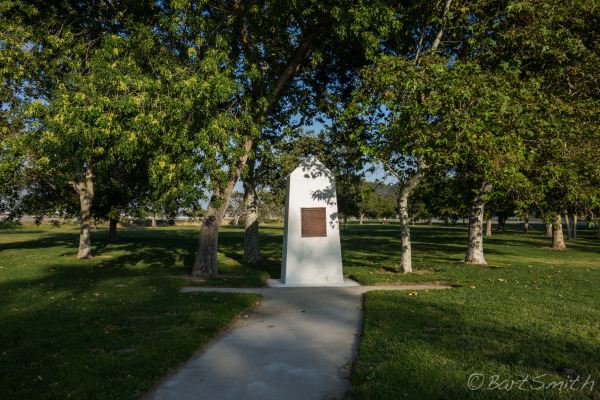 Monument at Sycamore Grove at western base of Cajon Canyon, Glen Helen Regional Park California. 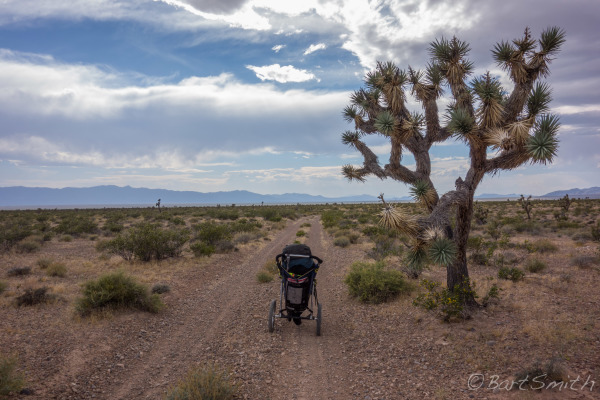 The Sycamore trees were the first large trees the travelers on the Old Spanish Trail would have seen since entering the Mojave Desert 300 miles prior. 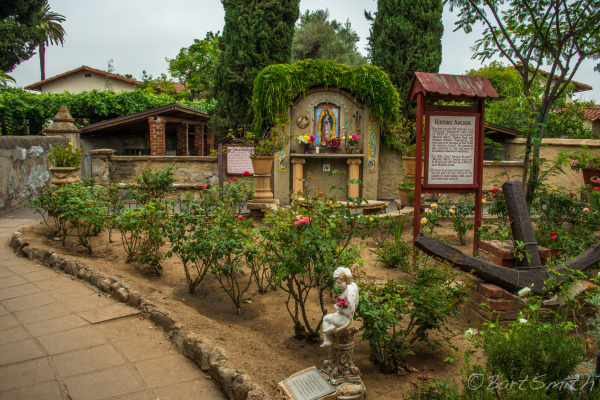 San Gabriel Mission, Los Angeles California. 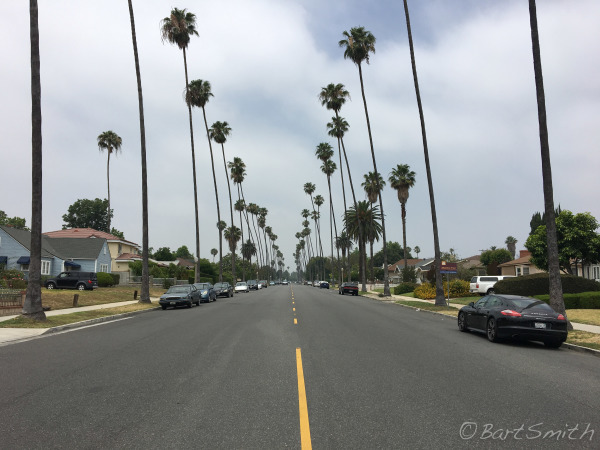 Palm lined streets of Los Angeles, California. 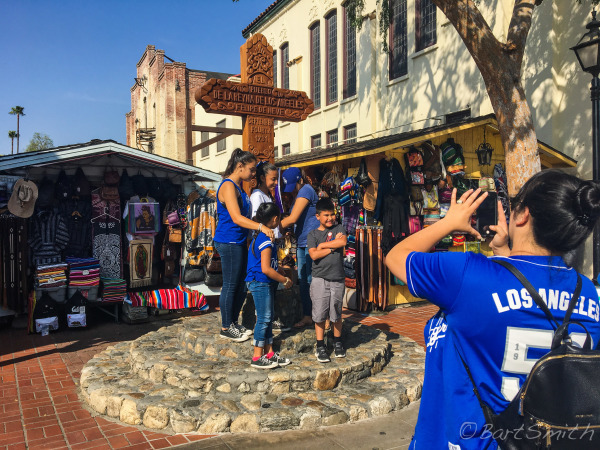 Olvera Street, Los Angeles, Ca. 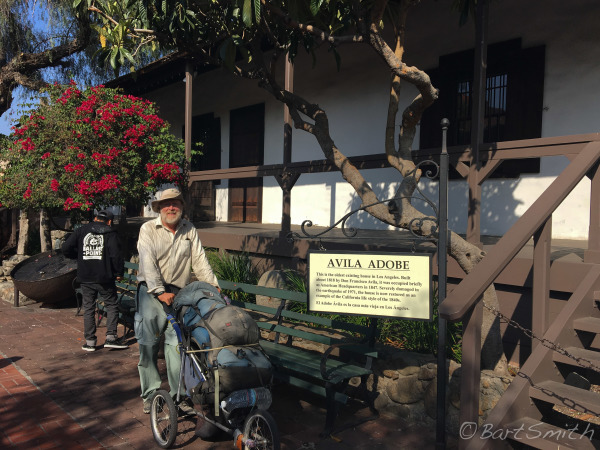 Myself upon "officially" completing my walk of the Main Route of the Old Spanish Trail from Governors Plaza in Santa Fe to Overa Street in downtown Los Angeles, California. 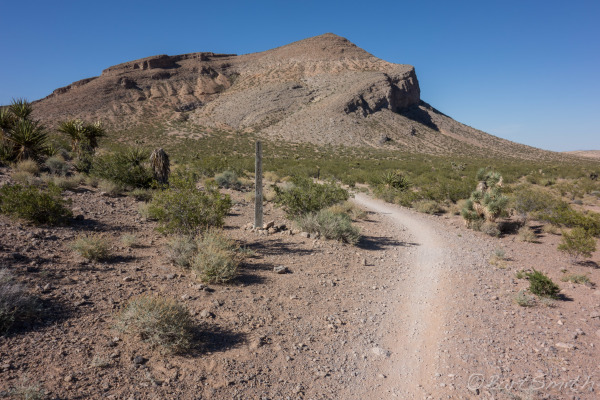 Some of the most remote and barren landscapes of North America are crossed by the Old Spanish Trail. 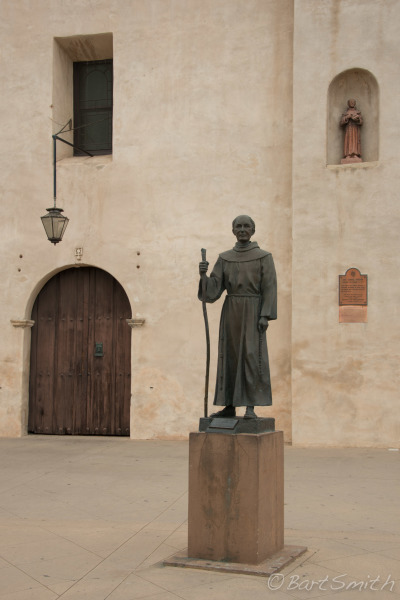 This route followed a succession of Native American footpaths to form several mule-train trading paths beween Santa Fe and Los Angeles in the period between Mexican Independence and the Mexican American War (1821 -1848). Slowly moving mule train caravans carried wool and woolen goods west in trade for horses. 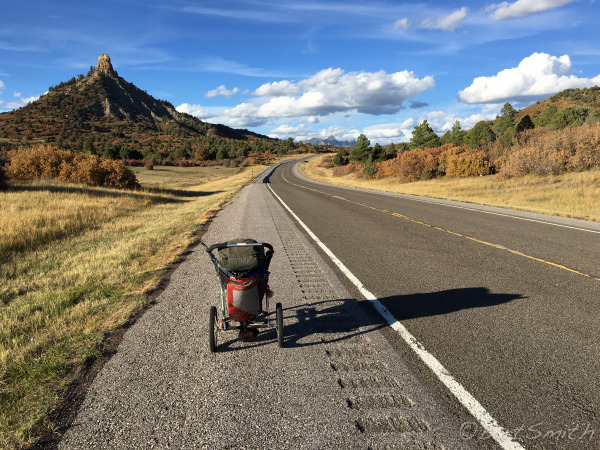 It was not a settlers' route and was too rough for wheeled wagons - yet it enhanced trade across the country. 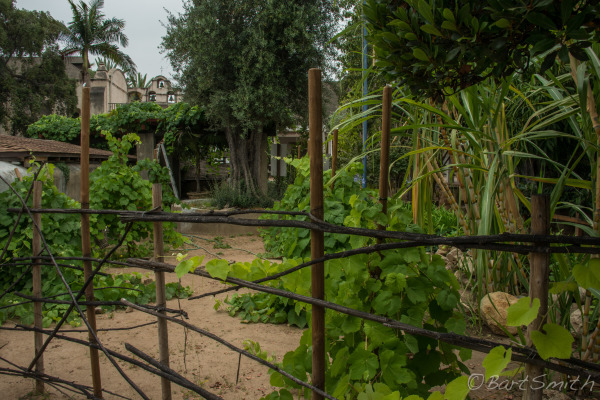 In addition, parts of the Trail saw Indian slave trade fueled by raids that took place in neighboring regions. 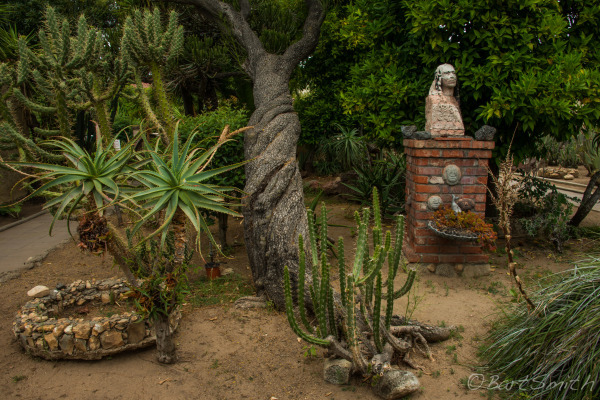 The aftermath of this slave trade was felt in Native communities for many years after the Trail fell into disuse. American explorers, such as John C. Fremont, used parts of it. 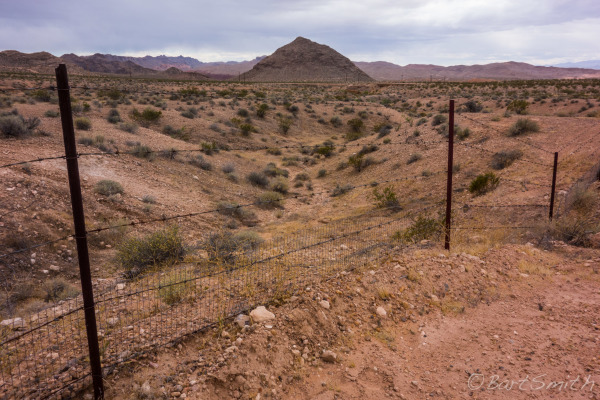 The National Park Service and the Bureau of Land Management share administrative responsibilities and work cooperatively with the Old Spanish Trail Association to protect and interpret the Trail.